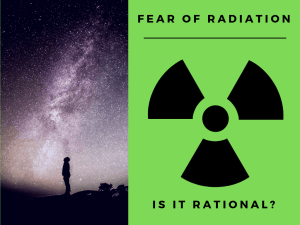 The fast non-leakage probability (Pf) and the thermal non-leakage probability (Pt) may be combined into one term that gives the fraction of all neutrons that do not leak out of the reactor core. 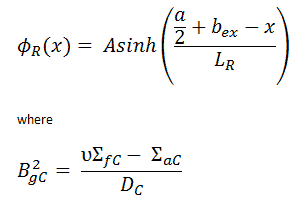 This term is called the total non-leakage probability and is given the symbol PNL. For large reactors, we can rewrite this equation without a substantial loss of accuracy simply by replacing the diffusion length Ld and the fermi age τ by the migration length M in the one group equation. The term B4 is very small for large reactors and therefore it can be neglected. We may then write. where M is the migration area (m2). The migration length is defined as the square root of the migration area. As can be seen the total non-leakage probability of large reactors is primarily a function of migration area. Except research reactors, practically all power reactor cores are designed to minimize the neutron leakage. 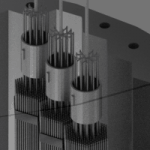 In order to minimize the leakage, neutron reflectors surround reactor cores. The neutron reflector scatters back (or reflects) into the core many neutrons that would otherwise escape. 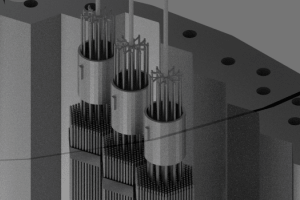 By reducing neutron leakage, the reflector increases keff and reduces the amount of fuel necessary to maintain the reactor critical for a long period. The mathematical treatment of a reflected thermal reactor can be illustrated most simply by considering a slab reactor of thickness a extending from x= -a/2 to x= +a/2 reflected on both sides by a non-multiplying slab (neutron reflector) of thickness b. Neutrons will be considered as monoenergetic with thermal energy. Although the one-group method may provide reasonable results for the reactor, this method does not accurately predict the flux. If d is not negligible, physical dimensions of the reactor are increased by d and this condition can be written as Φ(a/2 + bex) = 0. 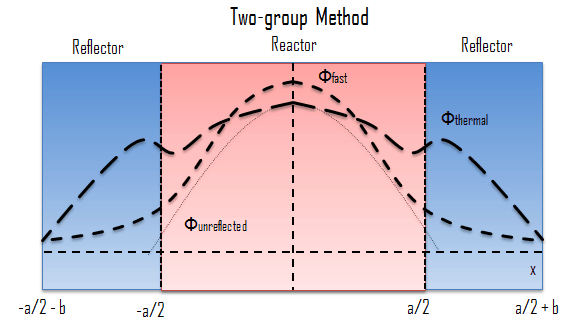 Neutron flux in a finite slab reactor according to the one-group method (with and without reflector). 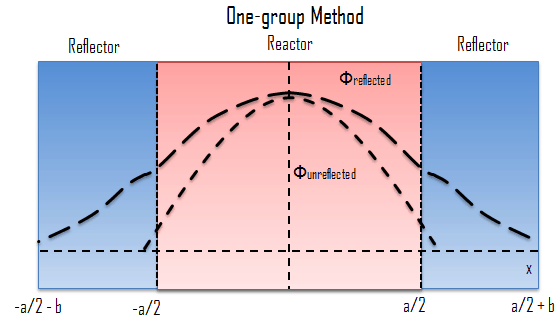 It was pointed out, the one-group method may provide reasonable results for the reactor, but this method does not accurately predict the flux. 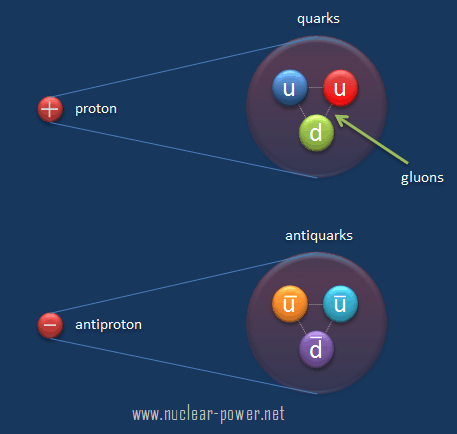 To be more accurate the energy of neutrons must be grouped into at least two groups. The two-group energy model leads to very interesting and important results, that must be considered in the design of nuclear reactors. In this method, the entire range of neutron energies is divided into 2 intervals (fast group and thermal group). All of neutrons within each interval are lumped into a group and in this group all parameters such as the diffusion coefficients or cross-sections are averaged. Reference: Ragheb, M. TWO GROUP DIFFUSION THEORY FOR BARE AND REFLECTED REACTORS, University of Illinois, 2006. 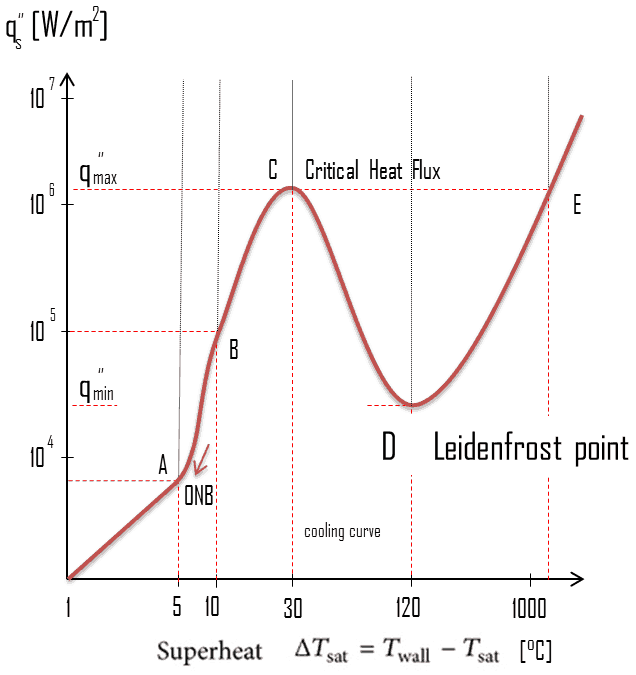 One of the striking results of such solution is that the thermal flux reaches local maximum near the core-reflector interface. This behaviour cannot be derived using one-group diffusion method, because it is caused just by thermalisation of fast neutrons. The fast neutrons, which are produced in the core can enter the reflector at high energy, are not absorbed as quickly in the reflector as neutrons thermalizing in the core, because absorption cross-sections in the reflector are much smaller than in the core (due to the absence of fuel). The thermal neutrons accumulates then near the core-reflector interface, resulting in the local maximum, that is usually known as the reflector peak. 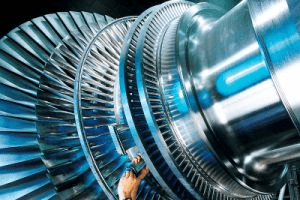 This also reduces the non-uniformity of the power distribution in the peripheral fuel assemblies and also reduces neutron leakage, i.e. increases keff of the system (or reduces the critical size of the reactor). This effect can be seen in the following figure. The reflector peak can be seen only in thermal flux within the reflector. It is found that the fast flux does not show recovery peaks in the reflector, but rather drops off sharply inside the reflector (due to thermalization and absorption). The neutron reflector scatters back (or reflects) into the core many neutrons that would otherwise escape. The neutrons reflected back into the core are available for chain reaction. This means that the minimum critical size of the reactor is reduced. Alternatively, if the core size is maintained, the reflector makes additional reactivity available for higher fuel burnup. The decrease in the critical size of core required is known as the reflector savings. The concept of reflector savings is very important in many reactor calculations. This can be interpreted as follows: when the neutron reflector has a thickness of a few diffusion lengths, the probability that neutrons that have come into the outer shell of the neutron reflector are scattered back to the core is very small, so that an even thicker reflector hardly yields extra savings. 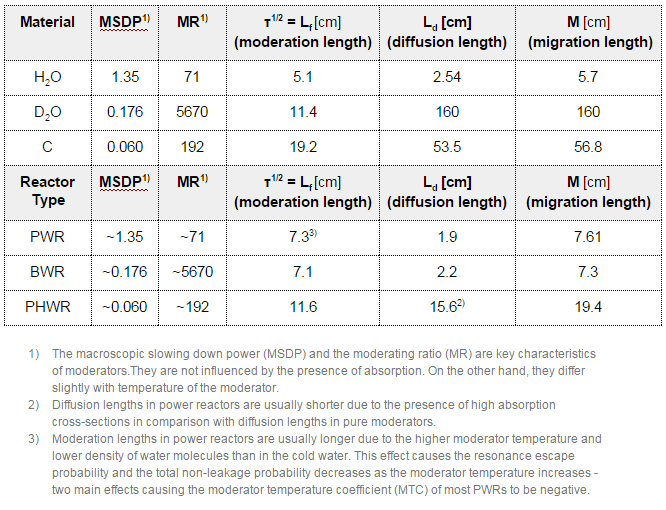 These effects, however, become less significant as the size of the reactor, measured in migration lengths, increases. The reflector savings amounts to a smaller fraction of the core dimension as its size becomes larger. Adding a reflector to a reactor allows either the volume of the reactor or the requirements on fuel to be reduced, or some combination of the two. If the reflector savings is known, the calculation of the critical dimensions of a reflected reactor needs only the solution of the bare reactor, which is simpler problem. 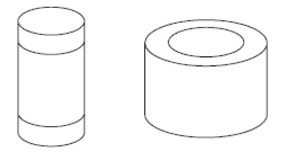 For example, for the cylindrical reactor, it is only necessary to determine the bare critical radius R0 and the reflected radius is simply R = R0 – δ, where R0 is critical diameter of a bare reactor. 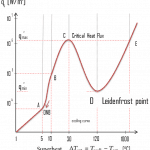 Logically, the reflector coefficient (albedo) increases, as the reflector thickness increases. But how thick should a reflector be? From engineering point of view, reflectors are, of course, limited by certain reactor design (e.g. by width of reactor pressure vessel). But, in general, very little is to be gained by increasing the thickness of the reflector beyond a value of 2L (2 x diffusion length). With H20 a thickness of 2L is only about 5 cm, whereas for D20 it is about 300 cm. It would require a considerable amount of D20 to extend the moderator by 300 cm, since this additional D20 is being placed on the outside of the core. 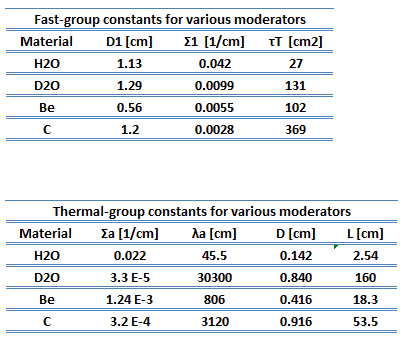 From these values, it is obvious the neutron reflector plays crucial role in heavy water or graphite reactors, in which the neutron leakage is higher than in LWRs. Reflector savings are not the only significant effect of the neutron reflector in reactor cores. The neutron reflector also influences the mean generation time and therefore influences the reactor kinetics. In the effect of a reflector on reactor kinetics, we are concerned with the time the neutrons spend in the reflector before returning to the core. In a thermal reactor, a reflector is generally chosen to help moderate the neutrons. 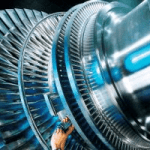 Consequently, the neutrons that leak out of the core as thermal, epithermal, and fast neutrons are reflected back into the core as thermalized neutrons. Note that the prompt neutron lifetime, l, is the average time from a prompt neutron emission to either its absorption (fission or radiative capture) or to its escape from the system. In an infinite reactor (without escape) prompt neutron lifetime is the sum of the slowing down time and the diffusion time. 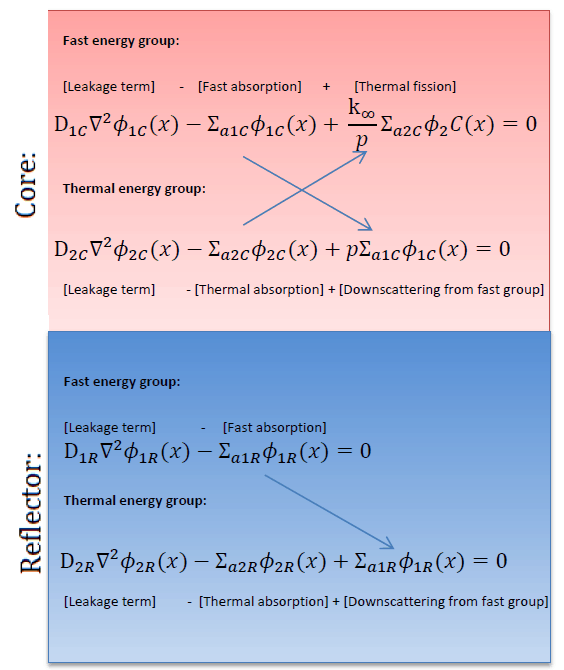 In an infinite thermal reactor ts << td and therefore l ≈ td. The typical prompt neutron lifetime in thermal reactors is on the order of 10−4 second. The neutron lifetime with delayed neutrons, ld, is the weighted average of the prompt generation times and a delayed neutron generation time. The delayed neutron generation time, τ, is the weighted average of mean precursor lifetimes of the six groups (or more groups) of delayed neutron precursors. In view of the time delay in the process of diffusing in and out of the reflector, the kinetics effect of a reflector can be thought of as an effective increase in the neutron lifetime in the core under steady state conditions, or as an additional delayed neutron precursor under transient operations.